Open to anyone who would like reserved seating for up to 10 people. Please list the names of the table guests below and provide a tally of Dinner Entrees. Full payment is due upon registration. This allows admission to all 25th Anniversary Gala related events for the whole weekend. This allows admission to all 25th Anniversary Gala related events for the entire weekend. For the 25th Anniversary Gala, please list the names of the table guests below and provide a tally of Dinner Entrees. Full payment is due upon registration. This allows admission to all 25th Anniversary Gala related events for the whole weekend. Table seats 10. 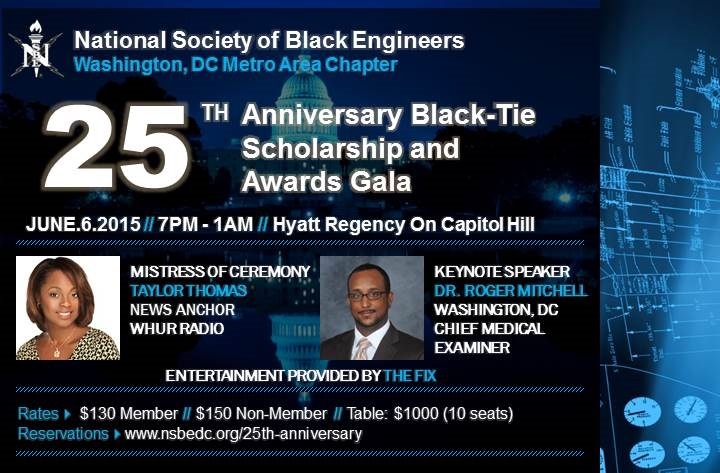 Join us for the highly anticipated NSBE DC 25th Anniversary Weekend, June 5th-7th, 2015. The signature event of the weekend will be the 25th Anniversary Gala on June 6th, 7 pm- 1 am at the Hyatt Regency Capitol Hill. The purpose of the gala is to raise scholarship funds for high school seniors pursuing undergraduate degrees in engineering. You may purchase a package price for the weekend which is inclusive of ALL 25th Anniversary activities listed above or you may opt to purchase tickets for the Gala and additional 25th Anniversary Weekend events a la carte. A la carte pricing for weekend activities will go on sale April 20th! Please direct all inquiries to the Special Events Chair at specialevents@nsbedc.org.